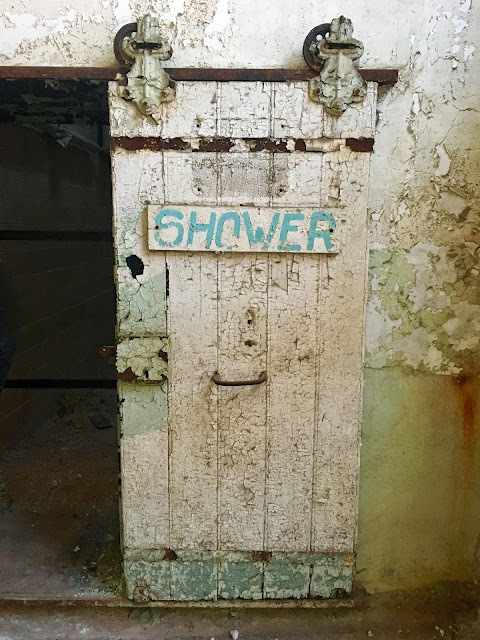 Eastern State Penitentiary is a fortress in the middle of a city. 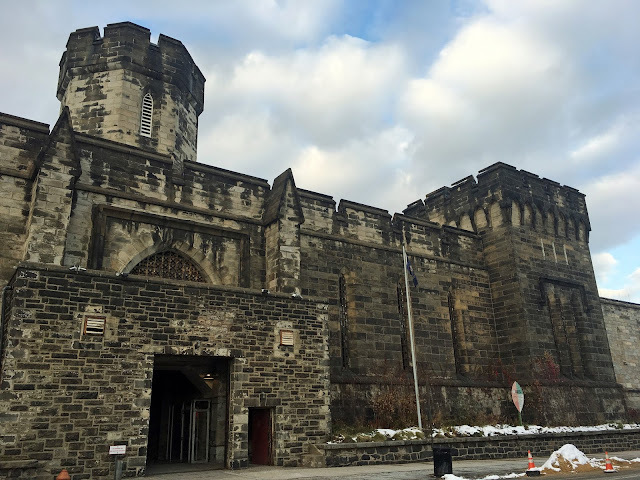 Located in Philadelphia, Pennsylvania, the prison looks like a medieval castle. Much of the prison is in its original condition, with 8 of the 14 cell blocks open for touring. 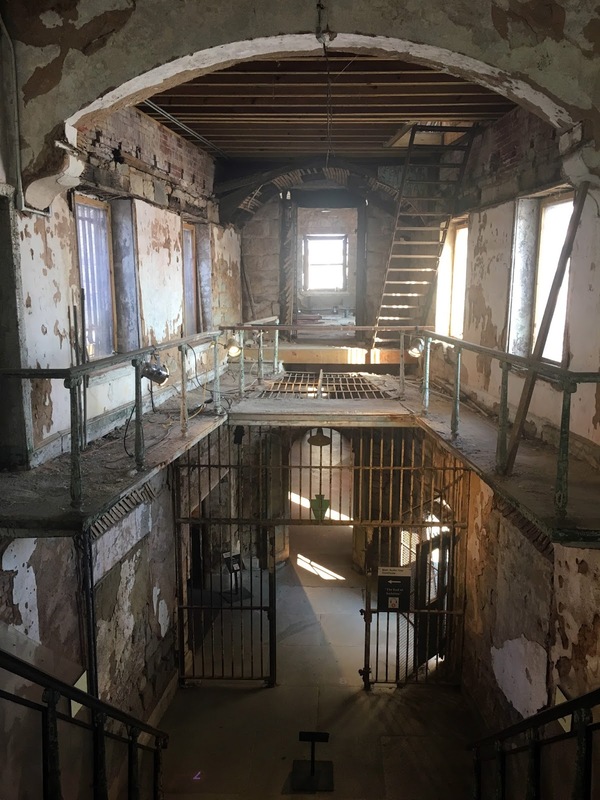 The brochure for Eastern State Penitentiary in Philadelphia, Pennsylvania says it was "the world's first true penitentiary, a building designed to inspire penitence - or true regret - in the hearts of prisoners." Eastern State Penitentiary is based on a "hub and spoke" floor plan, where each cell block extends from the Surveillance Hub in the center of the prison. You can see an aerial view of the penitentiary HERE. In the photo below you can see three of the cell blocks extending from the hub. 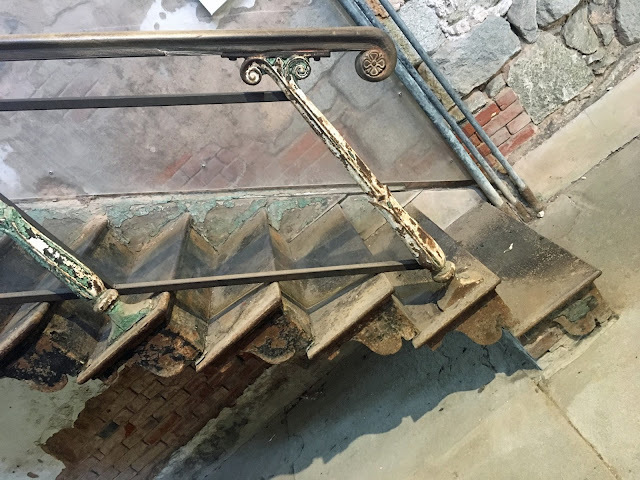 Eastern State Penitentiary inspired the design of most prisons built in Europe, Asia, South America and Australia during the 1800s. There are about 300 copies in all and dozens are still in use today. It's known as the Pennsylvania System. Most American prisons were modeled after Sing Sing Correctional Facility in New York State. 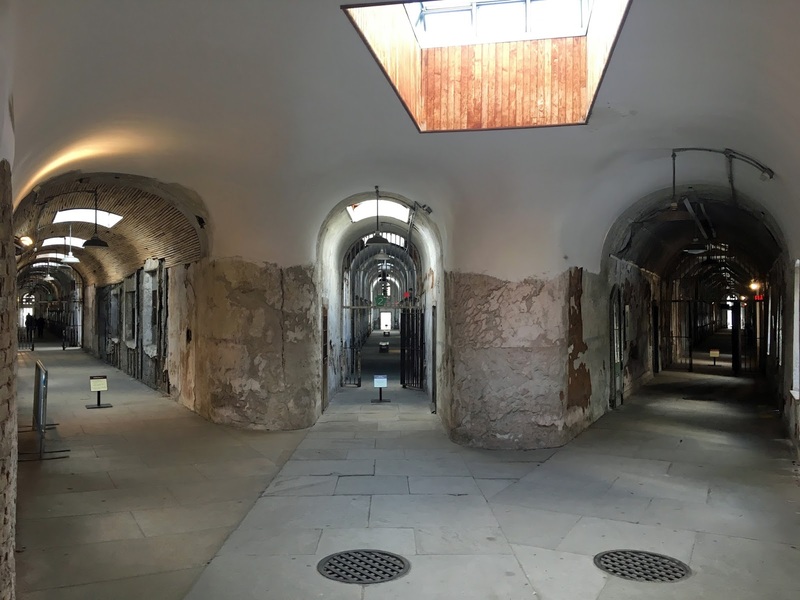 The design of the Eastern State Penitentiary was created to keep prisoners in solitary cells. 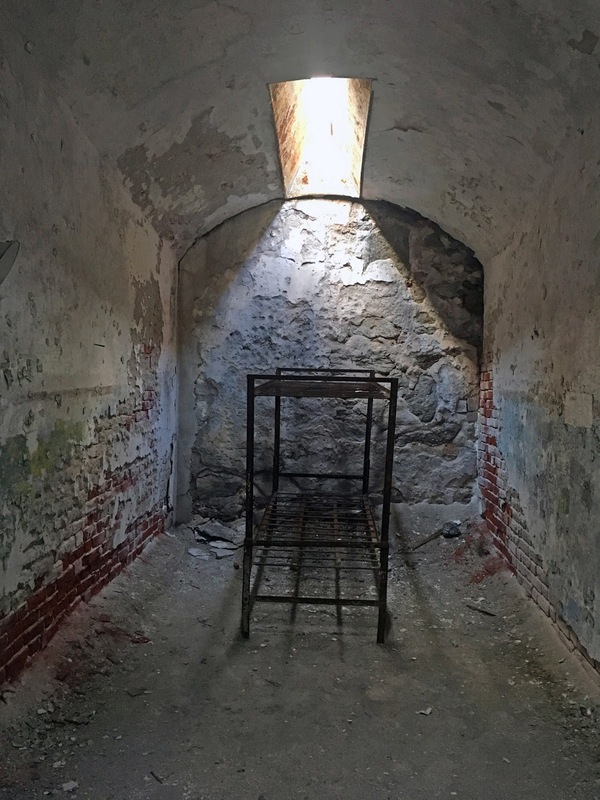 We were told that they often put hoods on prisoners to move them from cells to other portions of the prison, and the guards wore socks over their shoes to muffle the sound of their footprints. The experience of the prisoners was a solitary, silent one. 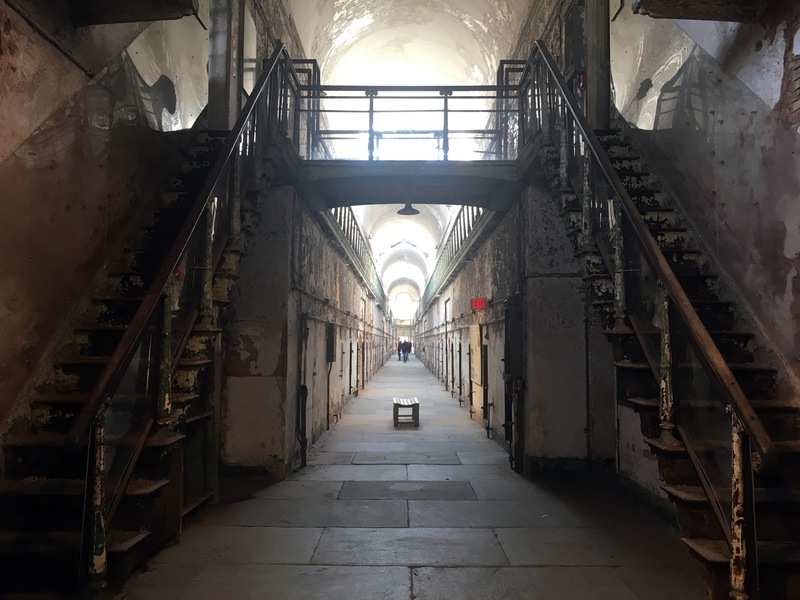 The cells are vaulted, with skylights, and some of them held our nation's most notorious prisoners. The cell block walls are stone and the cells look cold and bare. Bed, sink, a metal toilet, some had desk areas. These shower doors were found in the hospital wing. Everything is old. Here's a set of worn stairs, with rust and peeling paint. I will be posting more photos in the future, but if you want to see more check out the website and look at this little online tour. This is definitely one of the top ten tours I've been on in the country. I highly recommend visiting if you're ever in the Philadelphia area.